Congrats, your resume caught the eye of your target employer! Now the only thing standing between you and the job is the interview, so it’s essential that you nail the thing! It’s not only the interview itself that will determine your success however; in order to really put yourself in the running, it’s important that you are fully prepared ahead of the day and leave a lasting impression after the meeting. 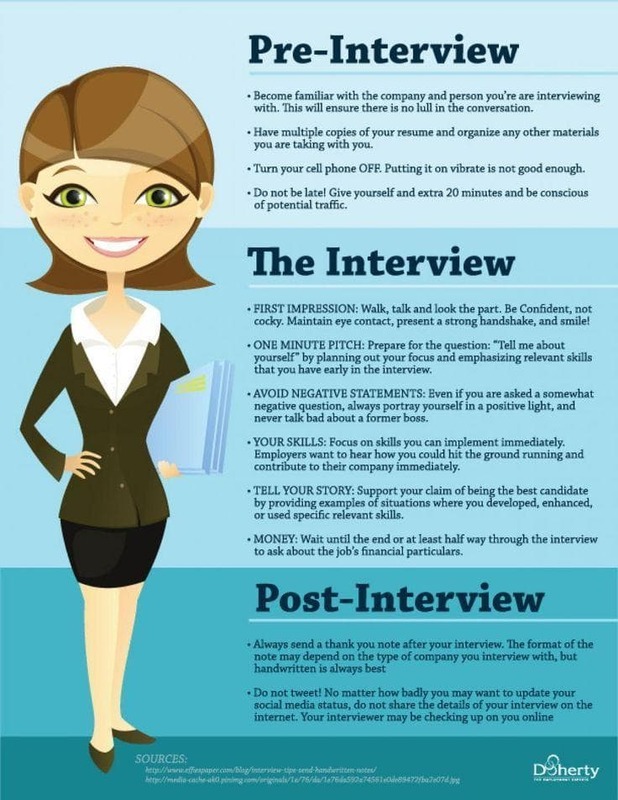 This infographic by Doherty Employment outlines the steps you should follow before, during and after your job interview in order to land the job! Familiarise yourself with the company and your interviewer. Make sure you have a copy of your resume and any other materials you may need to hand. Turn your phone OFF. Not just on silent, OFF! Give yourself plenty of time to get there. Being late is an absolute no no! Make a good first impression by coming across as confident and friendly. Maintain eye contact, greet your interviewer with a strong handshake and smile! Have a short pitch ready. They are likely to ask you to tell them about yourself, so prepare something that outlines your relevant skills and experience. Try to answer every question with a positive spin, even if they ask about your weaknesses. Focus on skills that are relevant to the role and real examples of how you have used them in the workplace. Employers want to hear what you could do for them. Wait until the end to ask about salary. Always send a thank you note after an interview, thanking your interviewer for their time and recapping on any important points discussed. Don’t post about the interview on social media, no matter how well you think it went!